I keep talking about making this post because I. LOVE. MOSAICS now and I can’t wait to tell you all about it! So I won’t! Wait to tell you, I mean. Here goes! This post could also be titled Pictures Extraordinaire because, like some overly enthusiastic parent, I took about one hojillion photos of each mosaic as it slowly developed. Hopefully you will be just as interested as I was in seeing the fascinating way mosaics come together. 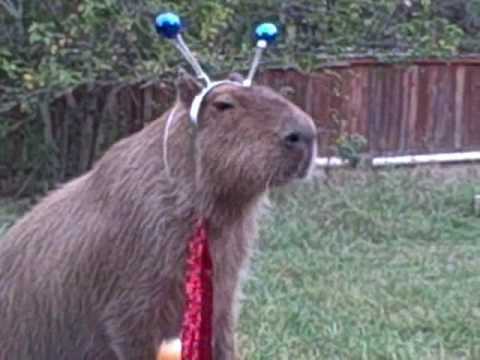 If not, here is a really funny picture of a capybara you can look at instead. My instructor for this class was the super-personable and talented Cynthia Fisher. She is a full-time mosaic artist, and her work is as intricate as it is gorgeous. You can check it out at her website. What I really loved most about Cindy was the down-to-earth and good-humored attitude she brought to the class. A lot of times with art-making, you find procedures that are finicky, complex, and rely on obscure and/or expensive materials and precise conditions. Not so with Cindy! She was all about finding the most accessible, affordable, and simplest ways to accomplish our goals. As a person who considers herself pretty practically minded, I found that totally refreshing. It also gave rise to a general atmosphere of camaraderie and fun in our classroom, which made the whole experience even better. Coming over from ceramics, I’m used to my artistic process being finicky, time-sensitive, and breakable. But, as Cindy pointed out, one of the cool things about mosaics is: fundamentally, they’re already broken. I think the looser, more spontaneous way of working, without freaking out about the work’s fragility, was really liberating. Now I had always thought of mosaics as a very planned process, because I was imagining that as you worked, you would glue each individual tessera down in place. That is one way to do mosaics, it’s called the Direct Method. But, Cindy’s technique is to lay a sheet of Frosty contact (sticky) paper over the drawing, sticky-side up. This way, when you lay the tesserae down, they are held in place by the sticky paper, but not so firmly that you can’t move them around. This let us be a lot more spontaneous and allowed for more editing of the design as we worked. This way is called the Indirect Method. One important detail I had to remember with this method, though, is that the side of the design that is facing up will eventually become the back of the mosaic: it’s the side that gets affixed to the backing board. (There is one way around that but I’ll get to it in the next post.) So, I had to keep in mind that my final piece would be a mirror image of my drawing. This also meant that if any of the tesserae I was working with had a “front” and a “back” side (like mirror glass does), I had to remember to put the “front” side down on the sticky paper so it would be face-up in the end. *Whew! * Anybody else noticing a theme of stuff continually being in reverse in all my Arrowmont classes?? Naturally, since Arrowmont has some of the most amazing and well-equipped studios anywhere around, they had all sorts of fancy glass grinders and cutters that cut the glass with water! Like, a super-powered jet of water! Glass newbie that I was, I was pretty amazed at that one. But, we mostly ignored all that expensive stuff and just used a pair of wheeled tile nippers, a tool that costs about $20. After chopping up a nice pile of glass bits, we were ready to lay down the tesserae! Here is the beginning progress with the nest and leaves. If you look closely, you can see a mix of vitreous and stained glass pieces. I learned from Cindy that I should always approach the mosaic by doing the more important and more intricate parts of the image first. That way, those bits get the clearest outline and definition in the finished piece, whereas the background can be allowed to get a little more random. Here I’ve started laying in some of the background: some pale taupe tree branches and a blue sky. If you look around the outer edge of the image you can see where the Frosty contact paper is taped down to a piece of cardboard backing. My sketch is sandwiched in between the cardboard and sticky paper. Annnnd here’s the finished layout! Now the piece needed to be attached to the backing board (we used hardibacker board) with thinset. I used a notched trowel to spread some thinset on the board, then lowered the board down onto the mosaic. After it dried, I got to peel off the cardboard & contact paper and see my image reversed for the first time!! Buuuut sadly I didn’t take a picture of that. I grouted it first, THEN took the picture! TA-DAAA!!! I chose a medium gray grout color for this one, which really helped bring the image together. I also painted the “margin” of hardibacker board a fresh green color, and went out and took this photo in the natural sunlight. Honestly, I was shocked that this came out as well as it did. I remember how my first pottery and sculptures looked, and comparatively, they were not nearly as pleasant as this! So with that unexpected success under my belt, I was hungry to make more mosaics!! I think the next one deserves its own post so stay tuned! I’m all settled back in Kentucky and couldn’t be more excited to get into my new studio space! I was lucky enough to be offered the position of Artist in Residence for the School of Craft at Hazard Community and Technical College this fall. So far, I have seen the studio but haven’t had a chance to set up yet. That should happen in the coming weeks. Can’t wait!!!! I will keep you all posted as progress is made! I have one more Arrowmont post to share with you, about what was hands down the class that exceeded my expectations the most: mosaics! Honestly, I may have found another life passion to rival ceramics, books, volleyball, and cooking. Yes, that’s right. I was pretty impressed myself. Next time I should be able to tell you all about it! Hello everyone! Welcome to my website and blog, happy to have you visit! Here in the blog section is where you’ll find in-progress photos of my work direct from the studio, as well as updates on shows, galleries, and some of my sources of artistic inspiration. I’ll begin by first thanking my wonderful web designer Kate Moore. Her site can be found here. She is a multi-talented designer and artist and a great friend of mine as well. She made this site possible so check out her awesome work!